#HelpWomenGetOnline : As mentioned in the Agenda, here are the highlights from the last session of Women On Web event. Our master in Action : Rekha Adhwaryu - A big thanks to her for motivating the women and co-ordinating with the whole event. We invited distinguished chief guests to award the certificates to the participants. 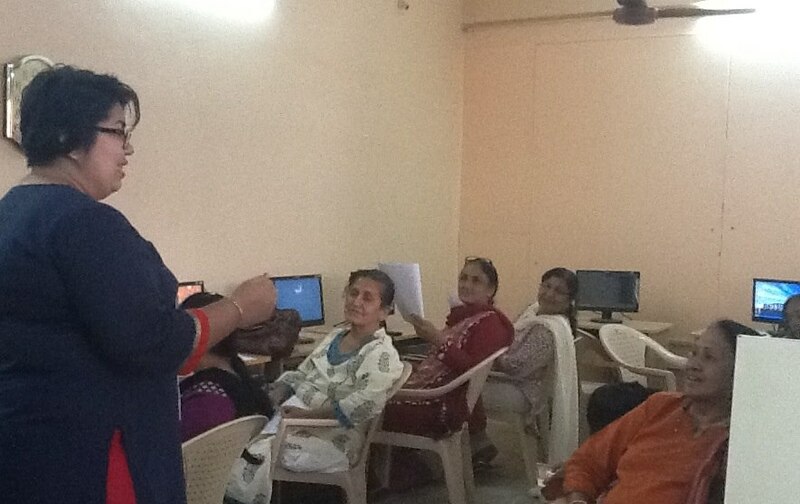 Jatin Chowdhary from eChai enlightened the women about entrepreneurship. Speakers getting awarded the certificates! #HelpWomenGetOnline : As mentioned in the Agenda, here are the highlights from the third session of Women On Web event. 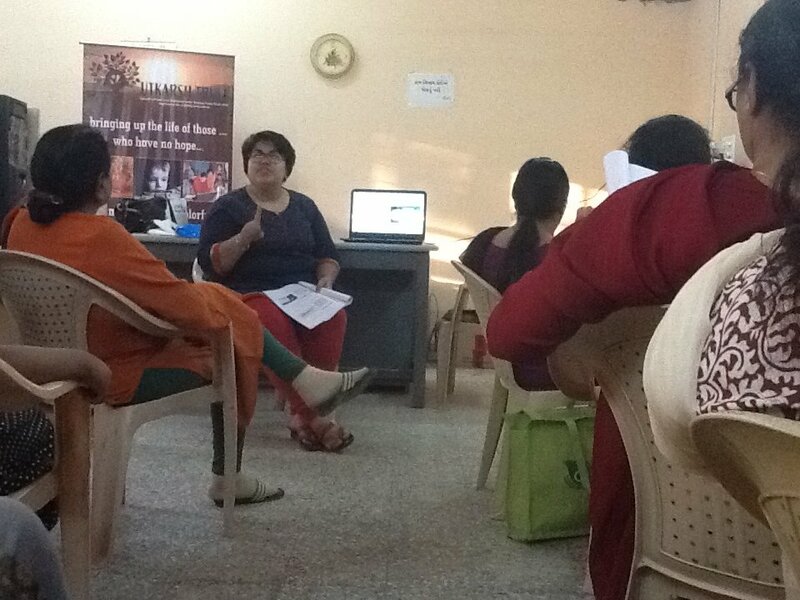 This session was aimed at introducing the participants to Blogging, Social Media and Smartphones. 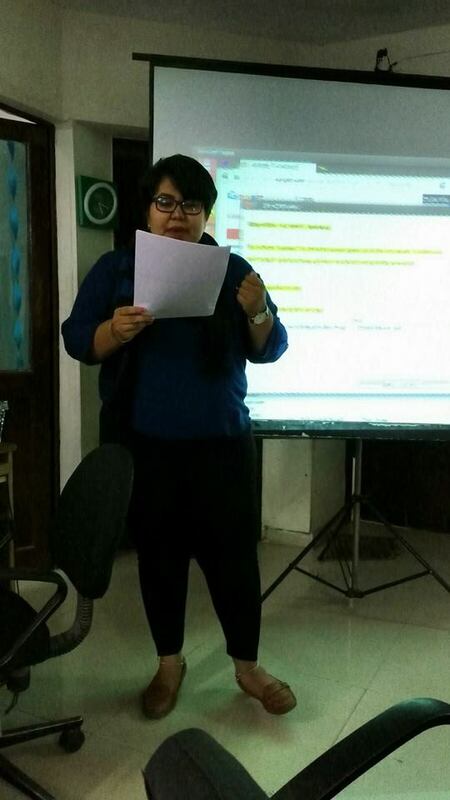 Our speaker Jenny Chawla started the session by introducing them about "Blogging". The participants were really excited with the concept of a "Blog" and all of them created their own blogs at the session. 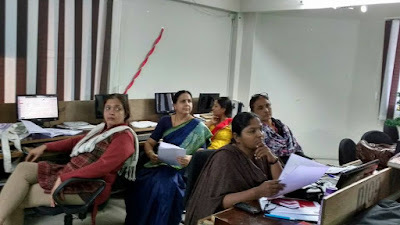 This was followed by a detailed informative session on different social media Platforms like Google+, Facebook, Twitter, Pinterest and Instagram. It took some time initially to understand the differences between all these social platforms, but ultimately they could get the concept well ! Jenny also taught them to use all these applications from their own smartphones, having the world on their fingertips ! A big thanks to Rekha ma'am for helping with the co-ordination. As this was a smartphone specific session, participants liked it the most ! I will update soon on our next session. #HelpWomenGetOnline : As mentioned in the Agenda, here are the highlights from the second session of Women On Web event. The session was mainly aimed at introducing the women participants to Gmail and YouTube along with a hand-on practice session. Our first speaker, Dhruva Shastri helped participants creating a Google Account and then explained them all the basic concepts of Gmail. All the participants found this tool very much helpful and interesting as most of them have their relatives staying abroad, and they'd be able to communicate with them well. Also, some women who wish to help their husbands with their business & work, were very much satisfied with the hands-on session. 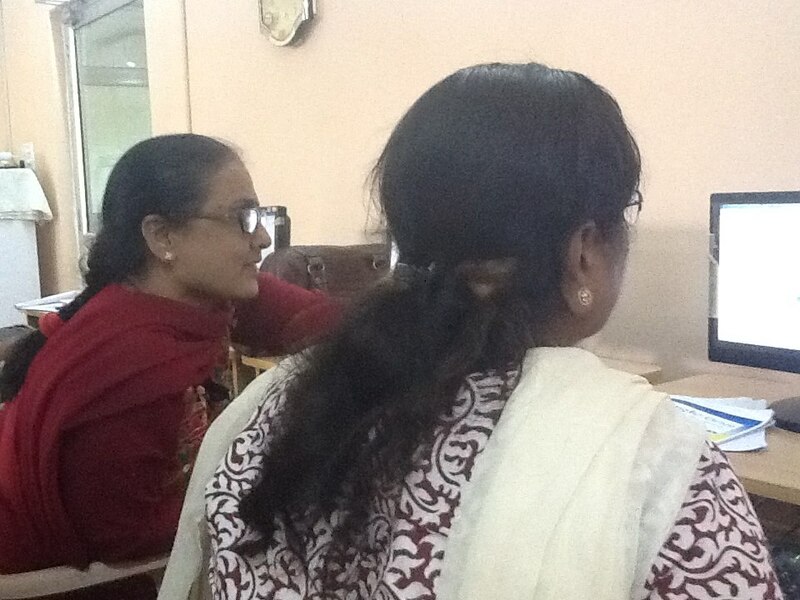 This was followed by the YouTube session, by Jenny Chawla. Jenny introduced the participants to the world of Online Videos via YouTube. The participants could make their channels on their own at the end of the session ! A big thanks to Rekha ma'am for helping with the co-ordination. Also, Pratik and Amar turned out to be a great support throughout the event. It turned out to be a very informative and interesting session overall ! I will update soon on our next session. 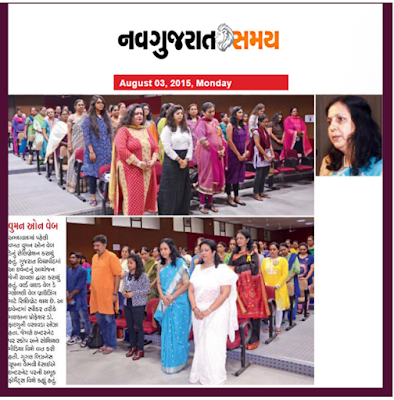 Seeing the awesome response of the audience at WWW Day Celebration, I have planned an initiative on “Women On Web” along with “Utkarsh” Foundation. 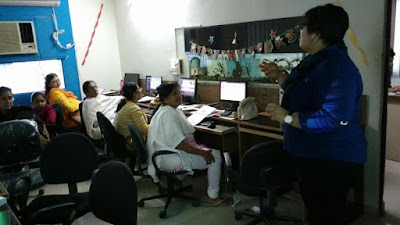 Utkarsh Charitable Trust is a registered non-profit organization, established to support the women who wish to meet their full potential in life, but need a helping hand. The mission to assist women in getting the education or training resources they need for career development. Rekha Adhwaryu is the founder of this organization. The main motive behind organizing this event is, to help women get online and to impart them basic technology skills, which would in turn make their lives easier ! The target audience is women from the age group 30-50 years. All the sessions are going to be hands on workshops led by different potential speakers and to be supported by some enthusiastic volunteers. The main sessions would be followed by practice sessions for each topics, which would make the concepts more clear and clarify the doubts and difficulties of the attendees. I will soon update about with the progress of our sessions. 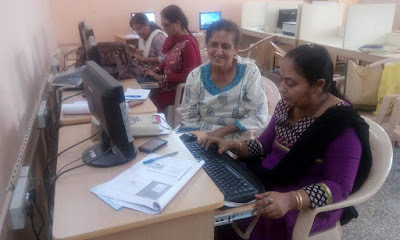 Utkarsh Charitable Trust is a registered non-profit organization, established to support the women who wish to meet their full potential in life, but need a helping hand. The mission to assist women in getting the education or training resources they need for career development. Utkarsh is founded and led by Rekha Adhwaryu. 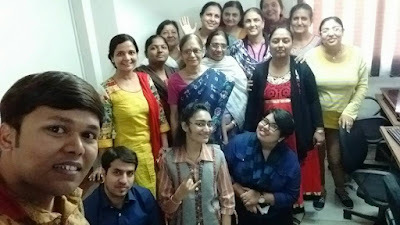 Utkarsh organized first ever World Wide Web Day Celebration in Ahmedabad (August 1, 2015), for the women of Ahmedabad city, in order to build up the WoW Tech Ahmedabad (World of Women rising for Technology). The participants were really very much satisfied with the learnings from the event. “Utkarsh” promised them to organize more events on “Women On Web” and “Help Women Get Online” in future also. After the session, a couple of women were felicitated by the “The WoW factor Award by Utkarsh”, who did some remarkable work for the upliftment and growth of women in society. Following are some of the coverage of the event in local newspapers. 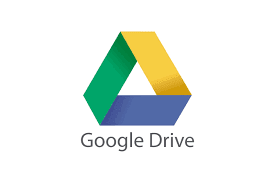 Google Developer Groups (GDGs) are for developers who are interested in Google's developer technology; everything from the Android, Chrome, Drive, and Google Cloud platforms, to product APIs like the Cast API, Maps API, and YouTube API. As a local chapter of GDG (GDG - Ahmedabad), we plan regular meetup/events to discuss, share experience, share and get knowledge amongst the group. In order to celebrate the month of International Women’s Day (March 8), we had a very successful event “Women Techmakers Ahmedabad” on 27th March, 2015 at Ahmedabad University campus. Currently, team GDG Ahmedabad includes Paresh Mayani, Dhrumil Shah, Ketan Raval, Vaibhavi Desai, Utpal Betai, Pratik Patel, Chintan Rathod and Dhruva Shastri. Following are some statistics regarding the event. 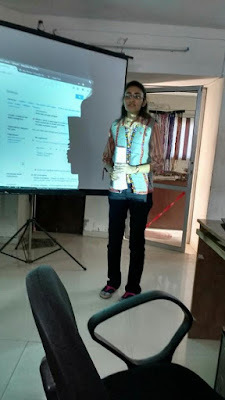 The event started with a talk on “Opportunities with Google” by the Women Techmaker Lead of GDG Ahmedabad, Vaibhavi Desai. 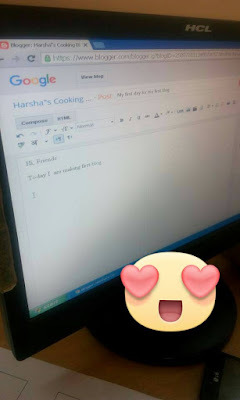 She explained different initiatives of Google for students and professionals. It included Google Student Ambassador Program, Google Developer Group, Google Business Group, Google Anita Borg Memorial Asia Pacific Scholarship, Google summer of code, Google internship/jobs etc. This was followed by a tech entrepreneurial talk by Nidhi Suthar, founder of a tech startup - “Persona”. She inspired the audience a lot ! Then we had a session on “Latest trends in Android” by Dhrupal Patel, who works as a Software engineer at InfoStretch Solutions Pvt. Ltd.
After two light sessions, we again had Vaibhavi Desai on board as a speaker, explaining the use of Git and GitHub in detail. She explained the whole technology from scratch, which the participants found very much useful in the era of collaborative working and open source contribution. We also had some product demos of the women-led-startups, where they talked about their lives, their experiences, how they are using technology to take their startup to an altogether new level. 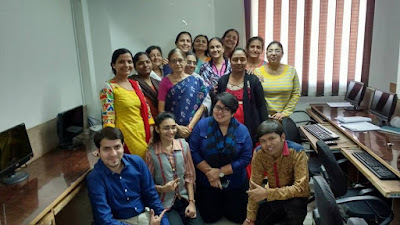 It included the talks of Monica Yadav (Respire Experiential Learning Group - Breathe the change), Kruthika Katrat (OoWomaniya - Women's Health and Wellness Companion) and Kanan Dhruv (Lawtoon - Where Children can learn the laws Comics way). One demo was on a budding startup - wWhere - World's First Location Sharing Service, which was presented by the team members Kajal Patel and Kinjal Patel. Last but not the least, the lighting talk by Aditi Gupta (Founder, Menstrupedia - Your guide to healthy periods) on “Using technology effectively for a social change” made a deep impact on people’s minds. Aditi is working towards spreading awareness about menstruation. Aditi made it to the achiever’s list of Forbes India 30 under 30, 2014 for her work towards breaking the taboo around menstruation. Menstrupedis’s website has 2 lakhs visitors per month and a community of 100+ writers on Menstrupedia Blog. Aditi is also is a TEDx Speaker and a Global Shaper at the World Economic Forum. She dreams of a future where menstruation is not a taboo but a welcoming change in a girl’s life. The biggest achievement of the event was, that we had a wonderful combination of leading women speakers - starting from budding and well recognized startups ( both tech and social ), bright students, experienced developers working in reputed companies of the city. As this was a woman centric event, we got an extraordinary response from the female participants saying that they want more and more events like this. The invited women speakers proved to be a great source of motivation for all the participants over there.